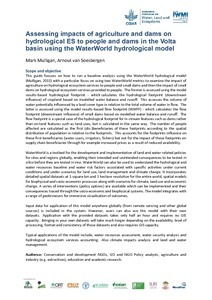 This guide focuses on how to run a baseline analysis using the WaterWorld hydrological model (Mulligan, 2013) with a particular focus on using two WaterWorld metrics to examine the impact of agriculture on hydrological ecosystem services to people and small dams and then the impact of small dams on hydrological ecosystem services provided to people. The former is assessed using the model results-based hydrological footprint - which calculates the hydrological footprint (downstream influence) of cropland based on modelled water balance and runoff. This assesses the volume of water potentially influenced by a land cover type in relation to the total volume of water in flow. The latter is assessed using the model results-based flow footprint (WWFF) - which calculates the flow footprint (downstream influence) of small dams based on modelled water balance and runoff. The flow footprint is a special case of the hydrological footprint for in-stream features such as dams rather than on-land features such as land uses, but is calculated in the same way. The number of people affected are calculated as the first (dis-)beneficiaries of these footprints according to the spatial distribution of population in relation to the footprints. This accounts for the footprints influence on these first beneficiaries (water users, irrigators, fishers) but not for the impact of these footprints on supply chain beneficiaries through for example increased prices as a result of reduced availability.